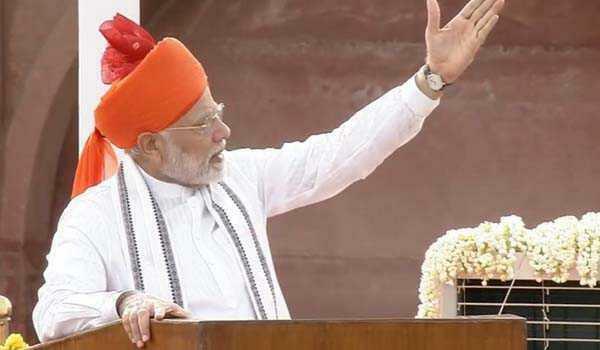 New Delhi, Aug 15: Prime Minister Narendra Modi on Wednesday said lives of three lakh children were saved due to Swachh Bharat Mission. 'Due to Swachh Bharat mission, lakhs of children can lead healthier lives. Even the WHO has lauded the movement,' Mr Modi said. 'Mahatma Gandhi led the Satyagrahis to freedom. Today, the Swachhagrahis have to ensure a Swachh Bharat,' Mr Modi said. To accelerate the efforts to achieve universal sanitation coverage and to put focus on sanitation, Mr Modi, launched the Swachh Bharat Mission on October 2, 2014. The Mission aims to achieve a Swachh Bharat by 2019, as a fitting tribute to Mahatma Gandhi on his 150th birth anniversary..